This post shall serve as my Disney redemption tale. It really doesn’t take much to make this girl happy, just a gluten-free donut. Or beignet, as it was in this case. I have written a total of two less-than-positive blog posts about dining experiences. One was about a visit to Walt Disney World. I traveled there for a marathon with a group of friends and had a really tough time eating there. I’m partially responsible for this as I wanted to eat at quick service restaurants in the parks, not sit-down restaurants. I also have more than one food issue: I’m gluten-free and vegetarian. Disney was quick to provide a list for each of those, but I was on my own to make it work from there. I just had a bad experience, which was hard for me. I’m a fan of Disney, I even got married at Disney World. I had read nothing but glowing reviews of how well Disney handles gluten-free dining, how quick the chefs are to come out to talk to you about options, how accommodating they area. Sadly, that just wasn’t my experience three years ago. 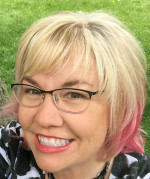 While at the Gluten-Free Living Conference, I had the chance to turn my past bad experience around. I went with Andrea of Rockin’ Gluten Free to Sassagoula Floatworks & Food Factory at the Port Orleans French Quarter Resort to get gluten-free beignets. Chef Malcolm came out to take our order, six beignets please! 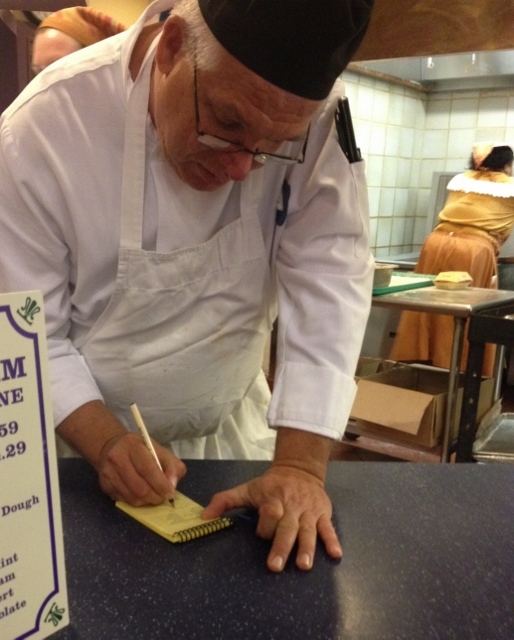 He wrote our order down on paper asked that we wait in the area while he prepared them. 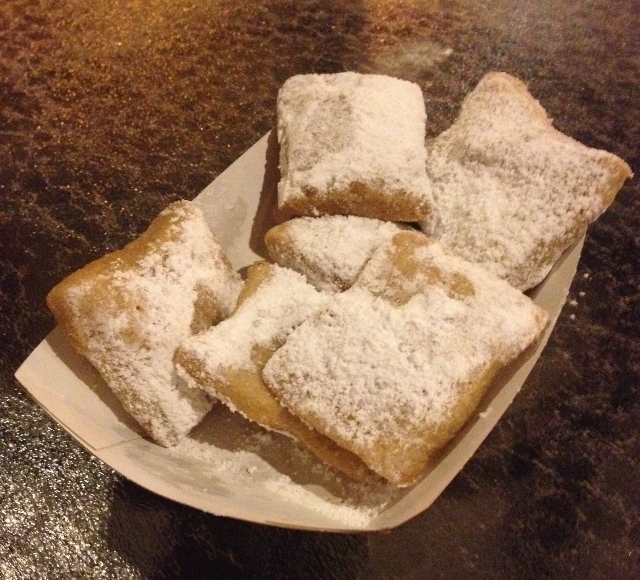 Gluten-free beignets are prepared by the chef in a dedicated fryer. We waited for just a few minutes, surely less than 10 minutes. Chef Malcolm returned with a basket of hot, fried dough plentifully sprinkled with powdered sugar. I asked what type of flour they use in making their beignets. Chef Malcolm told me they use Bob’s Red Mill pancake mix. (Potato starch, sorghum flour, tapioca flour, corn flour, evaporated cane juice, baking powder (sodium acid pyrophosphate, sodium bicarbonate, corn starch, monocalcium phosphate), baking soda, sea salt, xanthan gum.) Other bloggers have shared that Sassagoula Floatworks & Food Factory uses Bob’s Red Mill pizza crust mix. (Whole grain brown rice flour, potato starch, whole grain millet, whole grain sorghum flour, tapioca flour, potato flour, evaporated cane juice, xanthan gum, active dry yeast, sea salt, guar gum.) I’ll include links to other bloggers posts below. 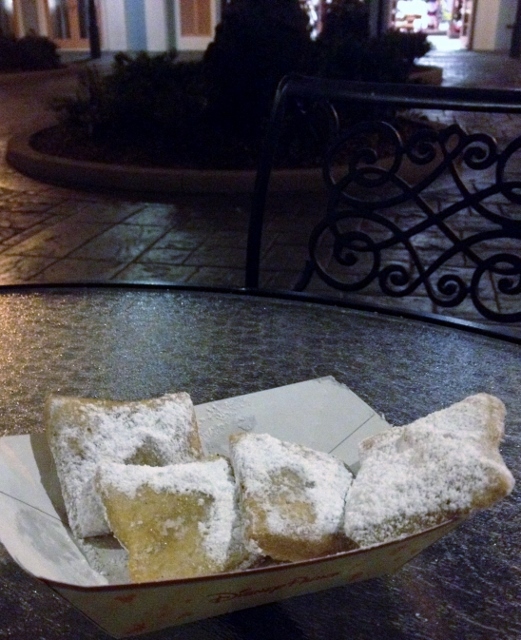 While these were no Cafe Du Monde beignets, they were hot, fried dough that happens to be gluten-free. A bit on the chewy side and not as fluffy as I remember gluten-full beignets being, but it was terrific to have the option. It didn’t take long for them to disappear. Not a bad use of $5. We sat outside in the courtyard to eat our beignets. It was quiet, peaceful and warm. While the other areas of Disney I visited on this trip were so very busy, Port Orleans was peaceful. It was a nice spot to enjoy a sweet treat without all of the frenetic energy of the busier areas. On the night of our visit, an acoustic guitarist was playing in a nearby bar, the tunes quietly drifting out into the courtyard. 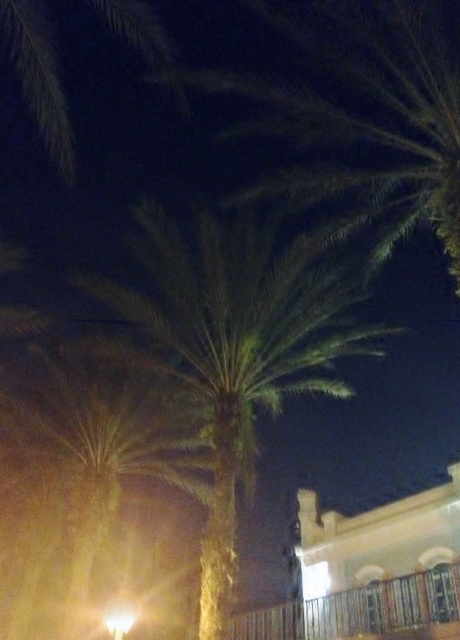 The walkways are lined with New Orleans-style street lamps and palm trees. Not that we were far away from the opportunity to purchase Mickey Mouse ears, but it felt very far removed from that, at least for a few minutes. Sassagoula Floatworks & Food Factory is located within the Port Orleans French Quarter at the Walt Disney World Resort in Lake Buena Vista, Florida. It was nice to turn around the past bad experience. And it was fun discovering a more peaceful side of Disney! I ate these last week! And the same chef took my order too. 🙂 We didn’t eat them on location, we took them back to our condo, so they were maybe 10 minutes old, but still warm, when I ate the first one. I found them to be very chewy and tough, and the middle was hollow like, only 1 band of dough going through the middle. Is this normal?? I envisioned a light doughnut in the middle – wondering if the texture changed since they sat a few minutes before we at them? Nice to have the options though!